Featured amenities include complimentary newspapers in the lobby, multilingual staff, and luggage storage. Planning an event in Munich? This hotel has facilities measuring 1292 square feet (120 square meters), including a meeting room. Self parking (subject to charges) is available onsite. With a chic, contemporary design and peaceful location, Leonardo Hotel Munich City South offers convenient transport links to the airport, exhibition grounds and city centre. Enjoy a drink in the bar or out on the rooftop terrace, dine in the restaurant and keep up to date with work or loved ones with the free Wi-Fi. Rooms feature double-glazed windows, modern amenities and en suite bathrooms with Sea of Spa products. The hotel also provides conference rooms with state-of-the-art facilities. Make yourself at home in one of the 55 guestrooms. Complimentary wireless Internet access keeps you connected, and satellite programming is available for your entertainment. Bathrooms have showers and hair dryers. Conveniences include safes, and housekeeping is provided daily. Familiar hotel, just 10 min from downtown. It has free parking and garden area with terrace. Rooms are equiped with central heating, TV, telephone, working desk, hair drier and some of them have security box. The hotel offers limited free parking spaces. NOTICE: the reception close at 00.00 hours. If the clients arrive later than 10 pm, they have to communicate it to the hotel. The hotel car park has a deposit of 50 eur that will be returned when leaving the park card. *Payment will be made at the check out. *To guarantee your reservation, we require a valid credit card. The hotel reserves the right to cancel the reservation if the credit card is not valid. *The annex building has no lift. Located in Munich (Munich City Centre), Hotel Munich City is within a 15-minute walk of Theresienwiese and Klinikum Grosshadern. 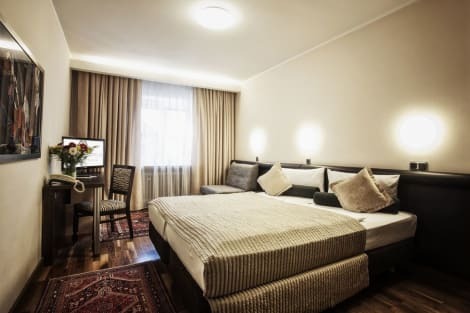 This hotel is 1.4 mi (2.2 km) from Marienplatz and 1.7 mi (2.7 km) from Viktualienmarkt.